Fudge is a gooey, chewy, chocolaty treat. Although you would be tempted to lick up the warm and sticky fudge as it is, it can be put to better use in irresistible desserts like Chocolate Walnut Fudge , Fudge Brownie Sundae , etc. Dark chocolate is especially good to make fudges because it not only gives the right texture but also gives a fairly strong cocoa flavour. Here, dark chocolate and peanut butter combine beautifully, helping bring out the best in each other in the Quick Dark Chocolate and Peanut Butter Fudge. Yummy rich dark chocolate sauce. The sauce consistency is free flowing and made by melting dark chocolate and adding honey and vanilla essence to give a lovely chocolate vanilla taste. Kids will love this sauce on its own. Use for ice cream toppings and sundaes. A novel dessert made of vanilla-flavoured milky pudding chunks, topped with delectably juicy, homemade strawberry sauce. Vanilla squares with strawberry sauce is also rich in nutrients like protein, calcium and vitamins, which is another reason to love it! Discover hot chocolate pudding(fudge) recipe at Tarla dalal.com. 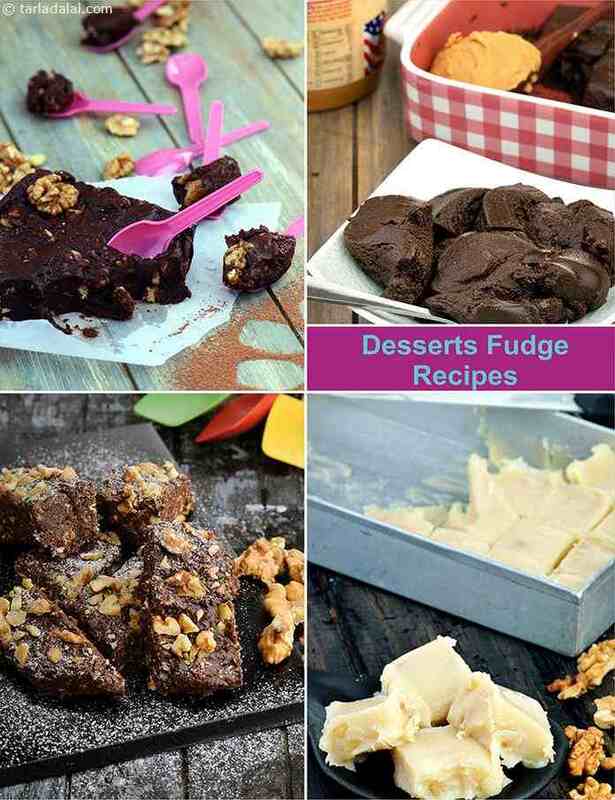 Find many easy to prepare quick, tasty pudding recipe, fudge recipe, chocolate recipe. Get ready to relish the nut fudge with this easy nut fudge dessert recipe. The nut fudge is prepared from sugar,chocilate, cream, vanilla and nuts. A perfect nut fudge recipe to be paired with ice cream or puddings. Get ready to relish the walnut fudge with this easy nut fudge dessert recipe. The walnut fudge is prepared from sugar, chocolate, cream, vanilla and walnuts. A perfect nut fudge recipe to be paired with ice cream or puddings. Discover a simple way to prepare peanut fudge recipe at tarla dalal.com. The nutty flavoured peanut fudge can be enjoyed with fresh cream, cakes or ice creams. Find many easy to prepare quick, tasty pudding recipe, fudge recipe, chocolate recipe. Get ready to relish the tangy lemon fudge with this easy lemon fudge dessert recipe. The fudge is prepared from sugar, lime juice, cream, vanilla and nuts. A perfect lemon fudge recipe to be paired with ice cream or puddings. A great tasting creamy chocolatey Chocolate fudge recipe to be enjoyed by all on a hot summer afternoon. Chewy Fudge Brownies serve this delicious dessert and surprise your dear ones. Choco Fudge is an amazing dessert for any special day. A classic dessert recipe made with a combination of biscuits and walnuts..